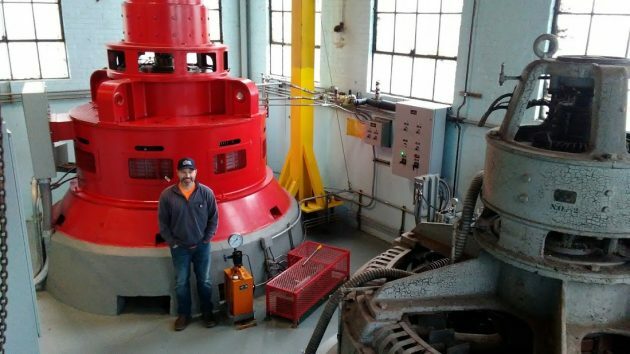 Brian Kuehn, lead water and canal operator, stands by Albany’s 500-kilowatt generator in the Vine Street powerhouse on Tuesday. The antique on the right is the No. 2 generator, inoperable for decades, made by Westinghouse in the 1920s. Albany officials think there’s a way to keep operating the city’s electric generator while cutting back on regulatory expenses. Let’s hope they are right and Albany’s historic role in hydropower production can be continued and preserved. Albany has generated electricity since 1888, starting with steam power. From 1924 to ’27, Mountain States Power built the existing powerhouse at the end of the Albany-Santiam Canal and installed two 500-kw generators. 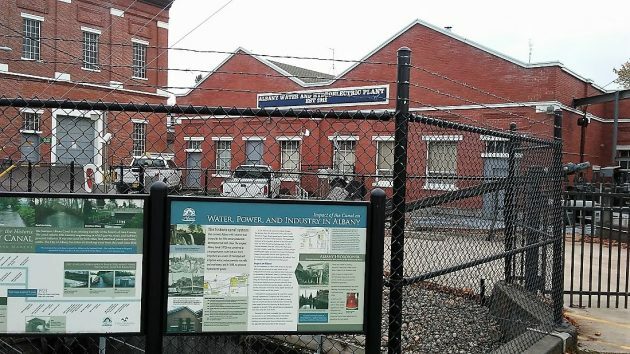 The city acquired the water system and hydropower plant from Pacific Power & Light in 1984, when only one of the two generators was still working. It shut down the working machine in 1992, but then applied for and received a federal minor-project hydropower license and put in a new 500-kw generator in 2008. The machine was purchased in China because, as I was told at the time, generators of that type were no longer made in America. The output, enough to power about 240 houses, is sold to Pacific Power under a 2008 contract. The revenue varies but averages about $80,000 a year. In recent years, federal regulators have increased requirements on hydropower waterworks to the point where the expense in time and money outweigh the income from the small Albany plant. In March the city council authorized up to $90,000 for a study on how best to continue operating the plant or shutting it down. The council got an update last week. Utilities Services Manager Mark Yeager said the staff consulted with a specialist in hydropower licensing law and met with Federal Energy Regulatory Commission officials from FERC headquarters. The upshot: The city could apply to give up its hydropower license and at the same time obtain a so-called “conduit exemption” that would cover the power plant alone. This would get the city out from under expensive requirements relating to the headworks on the South Santiam River and the 18-mile canal itself. Working all this out may take another three months. Then the council will have to decide which way to go. There is something both quaint and impressive about generating electricity, even a small amount, from the flow in the Santiam Canal. So I’m hoping the council will see fit to decide to keep this part of Albany history alive. Outside the Albany hydropower plant, you can read about its history. You write that the revenues from the power generation are $80K annual. Do you have any sense as to the cost of operations? Based on City reported revenue as reported by Hasso, the question then becomes, what are the costs associated with generating the $80-thousand dollars of revenue. Seen below are some estimates on annual operating costs. And, as Hasso writes, the generator is currently shut down to allow a different governing entity to do work on it’s water systems. With 2-months generating revenue already lost, amounting to nearly $20,000.00 in lost revenue, ballooning the deficit on Albany power plant operations to Nearly $50,000.00 for 2017, assuming the generator comes back on line December 1st. Of course, government does not exist simply to earn profit. Rather, government performs those tasks that private citizens are incapable of performing. The question that must be asked is: given the amount of power generation already in place, does it make any sense for Albany to operate it’s own tiny, money-losing electric generating facility. ISTR they only “repaired the banks” where the canal needed dredging (under the guise of “canal beautification” to supply the generator).. Can you point out any other places where the banks were “repaired”? I seriously doubt that work would have been done otherwise. Thanks for the update. Sure hope they can keep the plant going. I remember visiting the site in February of 2009, during the 150th Oregon Birthday celebration, when there was an open house for the dedication of the 2008 renovation. I’m glad our family took advantage of the tour to see it up close. It would be a shame for it to just sit there only as a museum. If it stays operating maybe they can swing it to get another generator and really pump out the power for those new tall street lights downtown. if that doesn’t work. Maybe they could shut it down and sell the property to Mcmenamins. No difficulty making this decision. There’s nothing inherently romantic about an old power plant. Its historic value is highly debatable. If it can pay its way let it stay. But it should be put on a strictly self-supporting budget. If it shows losses, out it should go. And that should be a full-costing model, including rent, overhead, equipment raplacement and depreciation.